You can see why no one ever talks about independence for Northern Ireland. Scotland would have a bad time as an independent country, but Northern Ireland would be utterly devastated without Westminster funds. An independent Northern Ireland would immediately face a horrific depression the likes of which we rarely see in the western world. Instead, the proposal is to reunify Northern Ireland with the Republic of Ireland. At first blush, it might seem easy to imagine that the Irish state could simply step into the role currently played by the British. Why can’t Ireland give Northern Ireland £9 billion per year itself? After all, Ireland has a significantly higher per capita GDP than Britain–the latest figures put Ireland at just over $67,000 to not even $40,000 for the UK. There are two key reasons why Ireland probably can’t do it. The first is that while Ireland has a higher per capita GDP, it is still a much smaller country with a much smaller economy. Total GDP in Ireland was $333 billion last year. It’s $2.622 trillion in Britain. £9 billion works out to about $11.63 billion. This is just 0.4% of Britain’s GDP. It would be about 3.5% of Ireland’s. To give you a sense of scale, for the United States, 0.4% and 3.5% is the difference between a federal program which costs $74 billion (about as expensive as tuition-free college) and one which costs $650 billion (slightly more expensive than the entire defense budget for 2018). Britain could pay the North Irish transfer almost nine years in a row before incurring an expenditure as burdensome as Ireland’s would be in the first year alone. But wait–it gets worse. The Republic of Ireland’s recent run of strong economic growth is largely reliant on its status as a tax haven. Ireland uses ridiculously low tax rates to coax transnational corporations into headquartering themselves in Ireland. By facilitating tax avoidance, Ireland attracts a lot of investment, all the while screwing over other rich democracies which would otherwise receive larger revenues. One consequence of this is that the Irish state is much more limited in its ability to spend money than most other European states. If Ireland tries to embark on bold new spending programs, it will have to raise its taxes, and if it raises its taxes it will no longer be able to steal investment from other countries. This means that Ireland doesn’t even spend $90 billion in total every year. So for Ireland, increasing spending by 3% of GDP means increasing the size of the government’s annual expenditures by around 10% of their present value. Expanding the budget by 10% would be hard in any context, but it’s especially hard when the firms that keep your economy afloat are only in your country because you don’t tax them. For these reasons, Irish reunification would badly damage the living standards of the people of Northern Ireland, producing a severe recession in that region. All of this would be true regardless of what level of public support Irish reunification may in the future come to have. Even a very peaceful, untroubled reunification would blight the lives of a generation of North Irish. The only way Ireland could avoid this would be by ceasing to be a tax haven or by sharply cutting spending on its extant citizens, and if Ireland did either of these things its economy would take a beating. The blight would simply shift from Northern Ireland to the rest of the country. This means that even leaving aside the possibility of violent reunification, all concerned should have a strong moral interest in maintaining the present relationship between the UK and Northern Ireland. Those arguing for reunification are either unaware of the economic suffering it would cause or see the people of Northern Ireland as sacrificial lambs for an Irish nationalist project. 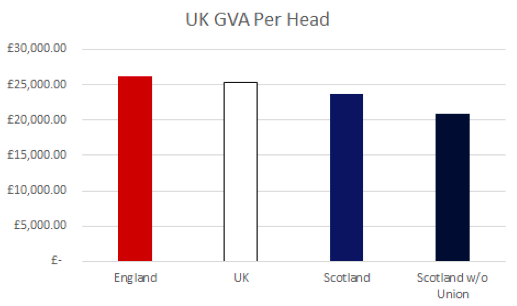 The British union redistributes a significant amount of wealth and income to its poorer regions, and those regions don’t have any other viable means of obtaining these material benefits. And this is one more reason why Brexit is a big mistake–if Brexit pushes Northern Ireland into leaving the UK, bad results will abound.